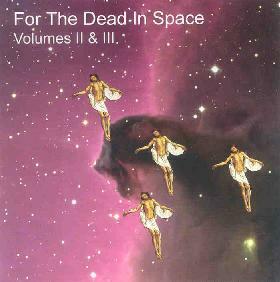 Various Artists - "For The Dead In Space: Volumes II & III"
If there is a single group that could be given the title of the “first ever acid folk group” it might just have to be Tom Rapp and his group Pearls Before Swine. Their first album, “One Nation Underground” was released in 1967, and all of the hallmarks of what is now termed acid folk are in place. Tom hung it up in the mid 70’s and became a successful lawyer, but following an appearance at the first Terrastock festival in 1997 saw a resurrection of his music career, and has since released some newer material as well as continued to perform occasionally. These performances gained his music a bunch of fans, many of whom appear on this rather massive 28-song double set tribute collection. The versions are all over the place, from folk to acid rock, from the straight ahead to the quite deconstructed takes that bear little resemblance to the source material (not that there is anything wrong with that!). I dig most of it quite a bit, with the highlights being the folks who make the songs their own while maintaining the fragile beauty of the originals - Marissa Nadler, The Olivetree (Jewelled Antler collective man Glen Donaldson), Alastair Galbraith, Black Forest/Black Sea, and Kitchen Cynics were probably my personal favorites. There is even a previously unreleased take of the song “Translucent Carriages” (released on Balaklava) recorded in 1967. It’s a great tribute to a fine artist, and if you are not familiar with the originals then try this anyway but MAN, get One Nation Underground and Balaklava as well. For more information you can visit the Secret Eye web site at: http://www.secreteye.org.